Evolution is a subject that comes up a lot in faith and science discussions, but not something that we at the Vatican Observatory have a special expertise in. We’ve posted a few useful bits on it here, but frankly we’re looking for suggestions from our readers of source material that you have found particularly useful in a classroom setting! To what extent can what we know from science about the origins of the universe and of life in the universe influence our basic human quest for understanding? From modern science we know that the birth and death of stars is very important. If it were not happening, you and I would not be here. In order to get the chemical elements to make the human body, we had to have three generations of stars. Did we happen by chance or by necessity in this evolving universe? There is a third element here that is very important. It is what I call opportunity. What this means is that the universe is so prolific in offering the opportunity for the success of both chance and necessary processes that such a character of the universe must be included in the discussion. Within such a universe all living things came to be through Neo-Darwinian evolution and the so-called Intelligent Design Movement is not a valid alternative. If we confront what we know of origins scientifically with religious faith in God the Creator, in the senses described above, what results? I would claim that the detailed scientific understanding of origins has no bearing whatsoever on whether God exists or not. It has a great deal to do with my knowledge of God, should I happen to believe he exists. Published in De las ciencias a la teología: ensayos interdisciplinares en homenaje a Manuel García Doncel. Click here for the full text, available from Taylor and Francis. Fr. George V. Coyne, S. J., Director of the Vatican Observatory from 1978 to 2006, writes that since chemical complexity and then life itself came about as part of the evolutionary history of the cosmos, it would be helpful to have an overview of that history. After an introduction to a few key concepts, several relevant topics in modern cosmology are reviewed. These include: the Hubble Law and the age of the universe; large scale structuring; galaxy formation and evolution; and cosmic chemistry. Also available, with illustrations, in Life in the Universe: From the Miller Experiment to the Search for Life on other Worlds (Springer, 2012). In this article, my intention is to go directly to the theological, anthropological, and philosophical question that is at the center of Darwinism and human existence—what does it mean to be human and Christian in the post-Darwinian world? The urgency of this question is forced upon us by the widespread revival of variants of sociobiology as a reigning paradigm within professional anthropology departments under such names as “biological anthropology” and “evolutionary psychology,” and by the intersection of this broad paradigm with the reigning Anglo-American philosophy of biology, and with molecular biology. The combination presents us with reductive evolutionary explanations of virtually all aspects of human existence. Click here to download “Being Human and Christian in a Darwinian World: An Appreciation of Józef Zycinski” from EbscoHost (EbscoHost is freely available through many libraries). The complexity and importance of discussions about biological evolution, human identity and human beliefs is of such importance that it is essential to establish an informed forum within which they can be discussed and explored. Modern biology is beginning to rediscover the notion of teleology, and explore its possible implications. Might evolution be much more directed as a process than might hitherto have been realized? Might we begin to speak of islands of stability (Conway Morris) in biological space? This important discussion requires a community which is both biologically and theologically informed – a relative rarity in today’s world. Yet the vision is worth pursuing, not least on account of the intellectual enrichment that it offers. If such an intellectual community does not presently exist, then it must most certainly be invented. Click here for McGrath’s essay, from Inters.org. Click here for a published version of McGrath’s essay, from the 2012 book Christianity and the Disciplines: The Transformation of the University (preview courtesy of Google Books). This article by Fr. George V. Coyne, S. J., Director of the Vatican Observatory from 1978 to 2006,was originally published in the Spring 2007 issue of Ignatian Imprints, the magazine of the Maryland Province Jesuits. It was also published in Thinking Faith in 2008. Click here for the article at Thinking Faith. Catholicism, Evolution, and Intelligent Design: What is the Relationship? It accords with what we know of the law impressed on matter by the Creator, that the creation and extinction of forms, like the birth and death of individuals should be the effect of secondary [laws] means. It is derogatory that the Creator of countless systems of worlds should have created each of the myriads of creeping parasites and [slimy] worms which have swarmed each day of life on land and water (on) [this] one globe. We cease being astonished, however much we may deplore, that a group of animals should have been directly created to lay their eggs in bowels and flesh of other,— that some organisms should delight in cruelty,—that animals should be led away by false instincts,—that annually there should be an incalculable waste of eggs and pollen. From death, famine, rapine, and the concealed war of nature we can see that the highest good, which we can conceive, the creation of the higher animals has directly come. Doubtless it at first transcends our humble powers, to conceive laws capable of creating individual organisms, each characterised by the most exquisite workmanship and widely-extended adaptations. It accords better with [our modesty] the lowness of our faculties to suppose each must require the fiat of a creator, but in the game proportion the existence of such laws should exalt our notion of the power of the omniscient Creator. Click here for the above excerpt as published by NYU press (1987). Click here for these ideas reflected in the concluding section of Darwin’s On the Origin of Species by Means of Natural Selection (from an 1870 edition). Click here to access this paper from the journal’s publisher. There are three principal pieces of evidence which, when taken together, support the notion that the universe as a whole is evolving. These are: (a) the Hubble velocity-distance relationship; (b) the abundance of light elements in the universe; and (c) the three degree cosmic background radiation. The best explanation of these observations is that the universe began, if it had a beginning, in a hot dense state and that it has been expanding and cooling down ever since. In the course of that process, matter came to be out of energy, galaxies and stars formed, and you and I came to exist. In this process the emergence of organic material in general, and human beings in particular, seems to have required a very fine tuning of the evolutionary process itself. We do not have a definitive scientific explanation of that fine tuning and, therefore, we do not yet understand the linkage of the human being to cosmic evolution. But some interesting suggestions can be made. Click here for a preview of this work, available from Google Books. A paper by Fr. George V. Coyne, S. J., Director of the Vatican Observatory from 1978 to 2006, that was published by the Pontifical Academy of Sciences (PAS) in a volume on Science and the Future of Mankind. It does not seem to me to follow that creation is denied because the Creator, millions of years ago, gave laws to matter. He first created matter and then he created laws for it — laws which should construct it into its present wonderful beauty, and accurate adjustment and harmony of parts gradually. We do not deny or circumscribe the Creator, because we hold he has created the self acting originating human mind, which has almost a creative gift; much less then do we deny or circumscribe His power, if we hold that He gave matter such laws as by their blind instrumentality moulded and constructed through innumerable ages the world as we see it. Click here for an excerpt selected by the Interdisciplinary Encyclopedia of Religion and Science (Inters.org), which is edited by the Advanced School for Interdisciplinary Research, operating at the Pontifical University of the Holy Cross, Rome, and directed by Giuseppe Tanzella-Nitti. The excerpt is from The Letters and Diaries of John Henry Newman, published by Oxford University press in 1961. We can only come to know God by analogy. The universe as we know it today through science is one way to derive an analogical knowledge of God. For those who believe modern science does say something to us about God, it provides a challenge, an enriching challenge, to traditional beliefs about God. God in his infinite freedom continuously creates a world that reflects that freedom at all levels of the evolutionary process to greater and greater complexity. God lets the world be what it will be in its continuous evolution. This article was originally published in The Tablet in 2005. [I]f the universe is a creation… then its natural capabilities are part of its God-given nature. That being the case, I am more inclined to look for the Creator’s signature in the generosity with which the creation’s formational gifts have been conferred. In other words, I think the Creator is better known by what the creation can do rather than by what it cannot. Click here to access this article via Christianity Today. Click here to access this article via EBSCOhost (available through many libraries). 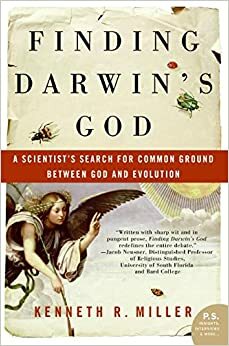 An excerpt from the book Making Sense of Evolution: Darwin, God, and the Drama of Life, in which the author, John F. Haught of Georgetown University, illustrates that there is a directionality, and thus a purpose, self-evidently present in the universe—and therefore that evolution cannot be described as aimless. Robert C. Berwick, Professor of Computational Linguistics and Computer Science and Engineering, jointly with Brain and Cognitive Sciences (Massachusetts Institute of Technology), discusses the rapid and mysterious appearance of language and rationality in Homo Sapiens, and only in Homo Sapiens. This talk was given at the inaugural conference of the Society of Catholic Scientists. Berwick also contrasts the language of Homo Sapiens (that is, human beings) with the communications of animals. Berwick notes that, while some animals can be quite smart, research shows that there is a large and clear distinction between animals and humans, even in those cases where animals have been taught human sign language. Click here for an article from Our Sunday Visitor entitled “Catholic scientists discuss faith’s role in work”, on the first conference of the Society of Catholic Scientists—“Origins”—held April 21-23, 2017 in Chicago. Click here for the Society of Catholic Scientists “Origins” conference page. Gregor Mendel was an Augustinian friar who founded the science of genetics. This book by Simon Mawer discusses Mendel’s life, life at his abbey, and the science and history of genetics. It was produced in association with the Field Museum in Chicago, which had an exhibit by the same name in 2006-2007. The web site associated with the book and exhibit is still available, as is a video from the Field Museum. (A Faith and Science entry for a related book on Mendel written for younger people is also available—click here). Considered one of the greatest scientists in history, Gregor Mendel was the first person to map the characteristics of a living things successive generations, thus forming the foundation of modern genetic science. In Gregor Mendel, distinguished novelist and biologist Simon Mawer outlines Mendel’s groundbreaking research and traces his intellectual legacy from his discoveries in the mid-19th century to the present. In an engaging narrative enhanced by beautiful illustrations, Mawer details Mendels life and work, from his experimentation with garden peas through his subsequent findings about heredity and genetic traits. Mawer also highlights the scientific work built on Mendels breakthroughs, including the discovery of the DNA molecule by scientists Watson and Crick in the 1950s, the completion of the Human Genome Project in 2003, and the advances in genetics that continue today. In an abbey garden, Mendel planted the seeds for the science of heredity. Born to poor tenant farmers in the Austro-Hungarian Empire, Gregor Mendel joined the Abbey of St. Thomas in 1843, at age 21. The Abbey was a dream come true for a budding scientist. A vibrant center of research, its friars were active in the sciences, linguistics, literature and philosophy. The Abbey made it possible for Mendel to attend the University of Vienna and to read widely in a library that contained 30,000 books. Mendel had diverse interests—astronomy, meteorology, physics, botany, and mathematics. He was one of the first scientists to use rigorous experiments and mathematical analysis as a means to study biology. In 1856, Mendel launched an ambitious series of experiments with Pisum sativum—the garden pea. Eight years and approximately 28,000 pea plants later, Mendel published the results of his grand experiment. His methods were so advanced and his results so groundbreaking that no one realized how his discovery would eventually revolutionize science. Mendel was right. In 1900 three European botanists rediscovered his work and set off a scientific explosion. The field of genetics was born and Mendel is considered its founding father. Click here for a Field Museum video for Gregor Mendel: Planting the Seeds of Genetics. Kenneth R. Miller, a biologist at Brown University and author of a widely-used textbook for high school biology, gives the St. Albert Award Lecture at the inaugural conference of the Society of Catholic Scientists. Miller gives an overview of conflicts that have arisen when people have opposed teaching evolution as subject matter in high school, discusses the tendency of some scientists to frame evolution in exactly the way foreseen by those who oppose its teaching, and provides a contrasting view of evolution: a view that “Finds God in All Things”. John D. Barrow (a cosmologist with Cambridge University in the U.K.) speaks at the inaugural conference of the Society of Catholic Scientists. Barrow’s talk includes an overview of cosmology since 1915, an outline of the characteristics of the universe, and the future of the universe, with occasional references to the Christian tradition. The video and audio quality is excellent, but the video does not include Barrow’s PowerPoint Presentation. Scroll down past the video for additional links. Dr. Lynn Rothschild and Fr. George V. Coyne, S. J.
Fr. George V. Coyne, S. J. explores the significance of the fact that we live in a universe that contains us—creatures capable of holding a conception of the universe in our own minds. “In us, the universe has become self aware.” Fr. Coyne served as Director of the Vatican Observatory from 1978 to 2006. Audio includes discussion by Dr. Lynn Rothschild of NASA Ames. Click here for an audio-only version of the talk with Fr. Coyne and Dr. Rothschild, courtesy of the Commonwealth Club of California, who hosted the discussion. Click here to download the audio file of this talk. Fr. George V. Coyne, S. J., Director of the Vatican Observatory from 1978 to 2006, writes that the relationship between religion and science has, in the course of three centuries, passed from one of conflict to one of compatible openness and dialogue. Evolutionary theory has raised numerous disputed questions among the Catholic faithful and other Christian believers concerning the relationship between faith and reason and between religion and science. As a team of Dominican friars and scholars committed to the preaching of the Gospel, we are convinced that the Thomistic intellectual tradition grounded in the philosophical and theological synthesis of our Dominican brother, St. Thomas Aquinas, O.P., who lived nearly 800 years ago, can still provide insightful and compelling responses to these questions. From our pastoral experience, we have discovered that Catholics and other Christians are frequently surprised by the novelty and brilliance of these Thomistic responses. Often, this is the case because these answers transcend and reconcile the dichotomies…. Unfortunately, the Thomistic responses to these disputed questions in science and religion are neither well known nor well understood. Click here for the Thomistic Evolution website. Click here for the 30 Disputed Questions in two-page PDF format. Fr. George V. Coyne, S. J., Director of the Vatican Observatory from 1978 to 2006, asks to what extent can what we know from science about the evolution of life in the universe influence our religious attitudes, and to what extent can religious thought make a contribution to our scientific understanding of the origins and evolution of life in the universe? Click here for a shorter version of this talk. A version of this essay appeared in Life as We Know It (Springer, 2006). This essay appeared in Life as We Know It (Springer, 2006). Click here for a longer version of this paper. Fr. George V. Coyne, S. J., Director of the Vatican Observatory from 1978 to 2006, writes that the conclusion to be drawn for both what we know of the universe and what we can surmise about God is that the supreme moral principle which should guide all of our ethical decisions is to empty oneself for the good of others. A version of this article was published in Science and Society: New Ethical Interactions (Proceedings of the International Symposium, Milan, 25 November 2005). Science Does Not Need God… or Does It? that our scientific understanding of the universe, untainted by religious considerations, provides for those who believe in God a marvelous opportunity to reflect upon their beliefs. A longer version of this article is available in Divine Action and Natural Selection: Science, Faith, and Evolution (World Scientific, 2009). It was an ancient puzzle that stymied history’s greatest minds: How did the fossils of seashells find their way far inland, sometimes high up into the mountains? Fossils only made sense in a world old enough to form them, and in the seventeenth century, few people could imagine such a thing. Texts no less authoritative than the Old Testament laid out very clearly the timescale of Earth’s past; in fact one Anglican archbishop went so far as to calculate the exact date of Creation…October 23, 4004, B.C. A revolution was in the making, however, and it was started by the brilliant and enigmatic Nicholaus Steno, the man whom Stephen Jay Gould called “the founder of geology.” Steno explored beyond the pages of the Bible, looking directly at the clues left in the layers of the Earth. With his groundbreaking answer to the fossil question, Steno would not only confound the religious and scientific thinking of his own time, he would set the stage for the modern science that came after him. He would open the door to the concept of “deep time,” which imagined a world with a history of millions or billions of years. And at the very moment his expansive new ideas began to unravel the Bible’s authoritative claim as to the age of the Earth, Steno would enter the priesthood and rise to become a bishop, ultimately becoming venerated as a saint and beatified by the Catholic Church in 1988. Combining a thrilling scientific investigation with world-altering history and the portrait of an extraordinary genius, The Seashell on the Mountaintop gives us new insight into the very old planet on which we live, revealing how we learned to read the story told to us by the Earth itself, written in rock and stone. Seashells on mountaintops are no longer a mystery. The science of geology employs thousands of people in academia, government, and industry. In searching for oil and mapping the structure of bedrock, geologists use Steno’s principles every day. Students of geology quickly learn to take them for granted. Out of these seventeenth-century ideas grew the modern concept of deep time, not to mention plate tectonics, evolution, global climate change, and dinosaurs. It all would greatly surprise Steno. What might seem surprising to us looking back at Steno today is his status as a figure of both scientific innovation and staunch religious piety. Despite De solido’s clear connection to the volatile issue of interpreting Scripture, Steno’s science was never criticized by his contemporaries on religious grounds. There is no evidence that the Church objected to anything Steno wrote, or pressured him in any way. Both the hyper-orthodox Cosimo de Medici and the progressive Leibniz encouraged Steno to continue his geological research.As for Steno, even at the height of his religious zeal, he never disowned his science, never showed any concern that it might infringe on his faith. Click here for an excerpt from the concluding chapter of Finding Darwin’s God. Click here for the publisher’s web site (HarperCollins). Evolution and Intelligent Design. Who Needs God? Is the Tension Between Faith and Science ‘Merely’ a Breakdown in Communication?